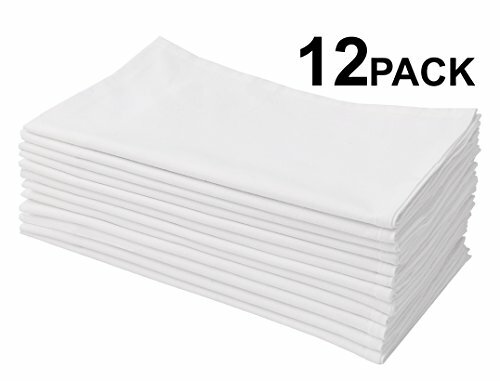 This 12 pack of Flour Sack towels can be used in multiple situations like, cleaning and drying glasses and stemware, wiping kitchen spills, cleaning windows and mirrors and many more. They are generously sized at 28x28. The heavy weight 900 gram/32 ounce construction take a lot of wear and tear. They will handle any job you will throw at them. Easy Care Machine Wash.
VALUE PACK: Each set contains, one dozen (12 pack) 100% Ringspun Cotton White Flour Sack Kitchen Towels. Each towel measures 28x28. VERSATILE: Multi-Purpose towels can be used just about anywhere in the home, restaurant, bakery, or commercial kitchen. These also make excellent everyday napkins. Ideal for embroidery projects. ABSORBENT: The pure cotton construction makes these towels / napkins extremely absorbent with very low lint. Ideal for drying, wiping, cleaning. Use them anywhere you need a lint free clean. EASY CARE: Easy care machine wash. Bleach Safe.